Silent Night, which opened its run at Opera San José on February 11, was the first opera of American composer Kevin Puts. It debuted in 2011 in St. Paul, Minnesota, and in 2012 Kevin Puts was awarded a Pulitzer Prize for the music. The opera delves into difficult questions about war, but also touches on the question of art and the artist’s relevance to society. As the German officer Horstmayer says, “Artists make bad soldiers.” But, as the opera shows later, art provides solace at our most pain-ridden moments. It is not simply the tool of the corrupt, the privileged and the indifferent, but is practiced by everyone, and its endurance links to the needs of the human heart. Opera San José’s production illuminates the opera’s dramatic engagement with war’s cruelty and futility. The composer uses a range of musical styles, including operatic pastiche, carols and marches, and Latin prayer, all hung together in a contemporary scoring that eschews bravura arias and favors a simpler song-like approach. There is even bagpipe music. The music always remains within contemporary classical music and maintains its own musical wholeness throughout. Mark Campbell’s libretto is based on Christian Carion’s multilingual screenplay for the 2005 film Joyeux Noël. Written in English, French and German, with some touches of Latin, the opera is based on the famous historical event that took place during the first winter of World War I, when French, British and German troops spontaneously called a cease-fire to celebrate Christmas. Across the desolate grounds of no-man’s land, soldiers met to exchange gifts, sing, and play soccer. Carion crosses this with another historical event, when Wilhelm, German Crown Prince, sends the lead singer of the Berlin Opera to entertain the troops at the front. A delicious soprano is added to the mix. The role of Anna Sørensen, the Danish soprano who connives to bring her operatic lover to the attention of the Crown Prince, is sung by soprano Julie Adams, whose many awards include winning the 2014 Metropolitan Opera National Council Auditions. Last season she returned to San Francisco Opera as a second-year Adler Fellow, and during the 2016–17 season she sang Mimi in La bohème at San Francisco Opera. Adams has a solid soprano with lots of heft and power, elegant tone and a dazzling stage presence. All necessary when you are the only woman on stage with troops of men, both soloists and chorus. Singing opposite her is tenor Kirk Dougherty, in the role of the operatic star Nikolaus Sprink. Dougherty has been a member of Opera San José’s resident company for the past two years. He has a tasty tenor voice and sincere dramatic skill, conveying Sprink’s dedication when he chooses to return to the front to sing to his comrades, rather than remain in the Crown Prince’s comfortable château. By that time our hearts are with him and the men he serves with. The male soloists, of which there were many, were all excellent, putting in heartfelt but unsentimental performances. Baritone Ricardo Rivers sang the French officer Audebert, and Brian James Myer sings his engaging aide, Ponchel. 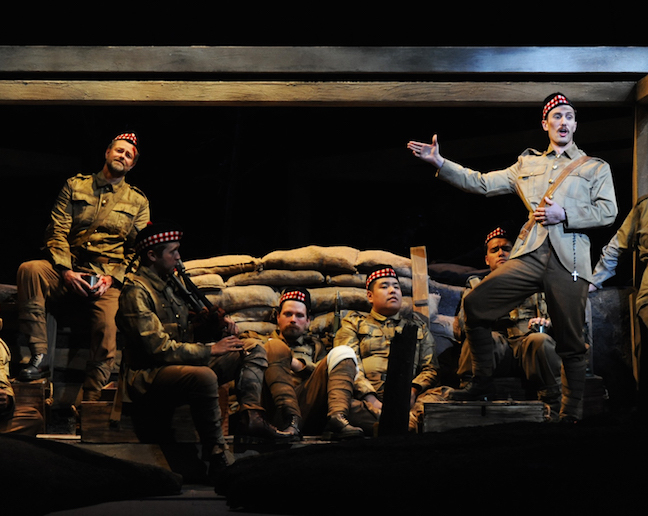 In the Scottish regiment, baritone Matthew Hanscom makes a tall and strapping Lt. Gordon, and the two brothers, Jonathan and William are sung by Mason Gates and Branch Fields. Bass-baritone Colin Ramsey sympathetically sings the chaplain. Kyle Albertson and Kirk Eichelberger sing the German officers. Christopher Bengochea (Crown Prince), Nathan Stark (French general) and Vitali Rozynko (British general) play the heavies. The officers who send the lieutenants, who have allowed their men to fraternize, to their deaths at Verdun and the French and Russian fronts. Joseph Marcheso conducted. Michael Shell was the stage director. The splendid singing was supported by designer Steven Kemp’s excellent stage sets with the silhouettes of burnt trees against a reddish sky, and three large and moveable bunkers that spun across the stage to highlight one company after another. Costumes by Melissa Nicole Torchia allowed the audience to distinguish between troops. Opera San José’s production of Silent Night continues through Sunday, February 26. For information and tickets, visit operasj.org. Photo: Colin Ramsey as Father Palmer in Opera San José’s production of Silent Night. Photo by Pat Kirk.